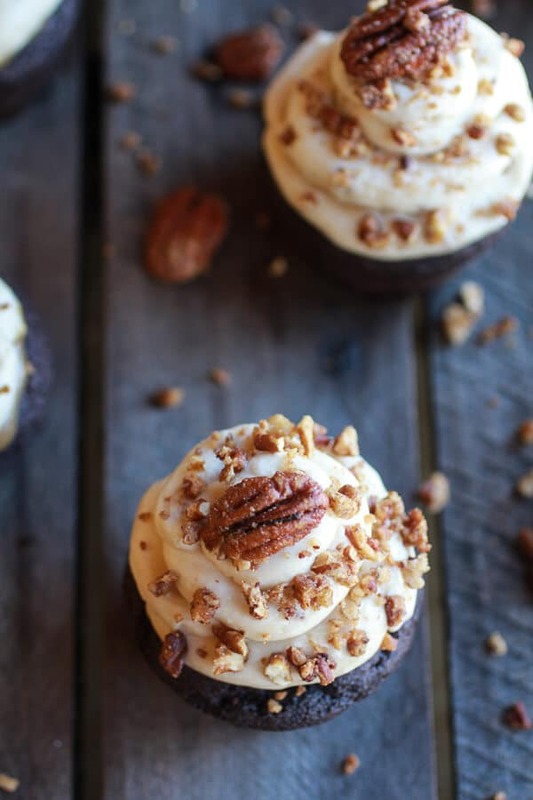 These Chocolate Bourbon Pecan Pie Cupcakes with Butter Pecan Frosting!! These cupcakes excite me greatly. Expect lots of exclamation point throughout the post. Sorry in advance, but I just cannot help it. I am a pecan pie lover all the way, of course it has to be a chocolate pecan pie. It’s what I grew up on, and also what I look forward to every holiday season. Chocolate everything and nothing a shade lighter than milk chocolate in its lightest form. Ok, there may be a few exceptions, like crepes, but even then, they have to be filled with things like chocolate ice cream. I really am having a hard time thinking of anything else, maybe a frosted sugar cookie at Christmastime. Preheat oven to 350 degrees F. Line 2 standard cupcake pans with 18 liners. In a medium bowl, beat the bourbon, canola oil, eggs, greek yogurt and sugar with an electric mixer. Slowly add cocoa powder, flour, salt and baking soda, combining on low speed until just incorporated. Fill baking cups three-fourths full. Bake for about 18-22 minutes. Allow to cool completely before filling, at least 2 hours or covered overnight. Meanwhile make the pecan pie filling. Combine 1/4 cup cold water with 2 tablespoons cornstarch, whisk until smooth. Add the brown sugar, corn syrup, eggs, salt and corn starch mixture to a sauce pot. Bring the mixture to a boil, whisking consistently for about 5 minutes. Do not stop whisking the mixture, especially in the beginning or you will end up with scrambled eggs. Remove the mixture from the heat and stir in the pecans, bourbon and vanilla. Allow the mixture to cool a few minutes and then transfer to the fridge for at least one hour or until completely cooled and thickened. To make the frosting. Preheat oven to 350 degrees F. Line a baking sheet with foil or a silicone baking mat. In a medium sauce pan, melt together 1/4 cup butter, cream, and brown sugar. Bring to a boil and boil for one minute. Remove from the heat and add to the bowl of a stand mixer. Place the bowl in the freezer (or fridge for longer) for 15-20 minutes or until cool. In a bowl whisk together the bourbon, 1 tablespoon vanilla, 2 tablespoons brown sugar and cinnamon. Add pecans and stir to coat evenly. Transfer nuts to prepared baking pan. Bake for 15 to 20 minutes, stirring occasionally, until toasted. Remove and toss the pecans with 1 tablespoon butter. Allow to cool 10 minutes, set aside. Now grab the cooled butter mixture and add the remaining 1/2 cup room temperature butter, vanilla and powdered sugar to the bowl and beat together until well combined. MIx in about 1/2 cup of the chopped pecans. If the frosting is not stiff enough to frost the cupcakes place it in the fridge for 30 20-30 minutes or the freezer for 5-15 minutes. The remove and whip it for a few second to get everything smooth again. To assemble the cupcakes: Use a small paring knife to cut a cone-shaped piece from the center of each cupcake. Fill the hole with the cooled pecan pie filling. Add the frosting (if you want to pipe the frosting on use a circular tip, double the frosting recipe and swirl the frosting on in a circular motion) and sprinkle each cupcake with the remaining pecans. If desired top with 1 whole pecan. 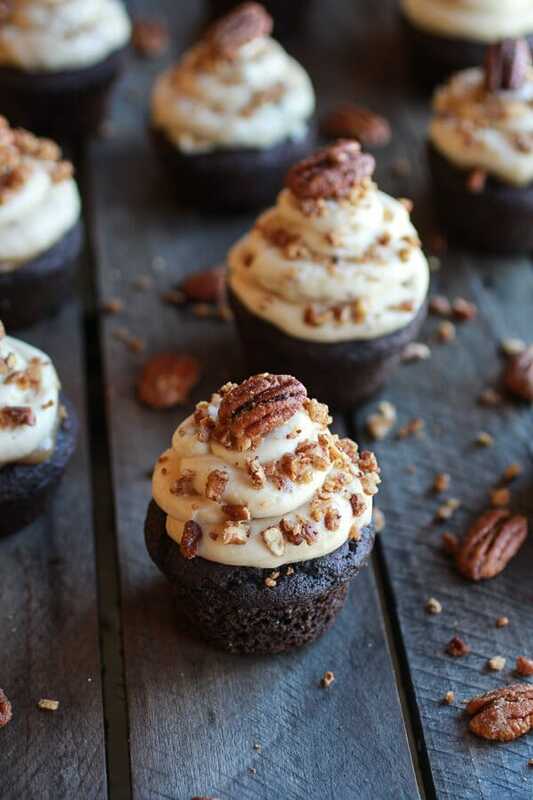 0 Response to "Chocolate Bourbon Pecan Pie Cupcakes with Butter Pecan Frosting"